When I want to find out who owns a domain name, I do a whois on one of the whois websites on the Internet. The domain look-up usually returns the domain owner, administrator, addresses and contact information. Problem is, that many whois sites only support specific regions, and that you may have to switch to another site to get the information you are looking for. WhoisThisDomain is a free portable Nirsoft application that simplifies the process, at least for Windows users. The program can be used to look-up one or multiple domains names. Even better, it will automatically request the information from the right server so that you do not have to worry about that at all anymore. A choose domains screen is displayed on first startup. You can enter or paste domain names into the form that you want to retrieve whois information from. Domain names can be entered one per line, or separated by commas or spaces. Once you are done editing it will try to retrieve domain name information for each domain name that you have entered or pasted into that form. A wait period of ten seconds between look-ups ensures that you do not hammer whois servers. You can change that number on the chose domains screen. Each domain is displayed in a row in the main interface. Lights at the beginning of each row indicate whether a domain is online or not. Following in line are the domain name, whois source, domain status and information when the domain name expires, when it was created and last updated. The whois information are displayed after you select a domain from the list. The output depends largely on the source. Some companies return the registrants name for instance, while others do only return generic information. 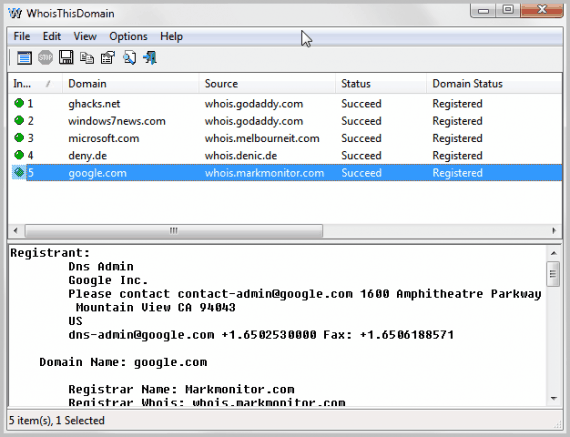 A whois on google.com for instance returns the Dns Admin as the registrant. All information can be copied and pasted. Records can also be saved to a text file or HTML file. Advanced users can override the default whois server list by adding their own whois servers to the program. You need to create the text file whois-servers.txt and place it in the program directory. Whois information need to be added in the way domain-extension whois-server to the text file. Check out the program homepage for some examples. WhoisThisDomain supports both generic and country code domains. The tool is compatible with 32-bit and 64-bit versions of the Windows operating system from Windows 2000 to the very latest Windows 7. I prefer who.is for information about the domains ..